A follow-up on the Saison I wrote about earler (Last entry 29 July, talking about using a helper yeast). Well, it’s partially carbed and delicious! For all of you afraid of warm fermentation, the Wyeast Belgian Saison strain loves heat. At times my fermentation was over 100 degrees and the beer shows no off flavors whatsoever. It’s bone-dry but the esters give it a sweet flavor, citrusy and spicy. The corn as well provides some sweet flavors. On request, I’ll provide the recipe. And one more thing: A bronze medal in the Colorado State Fair for my Schwarzbier. The next batch is ready to bottle. The last extract batch I did was a kit the local homebrew shop asked me to brew as a test. But it was a partial mash. And it came out wonderful. This time I really did it mostly the old-fashioned way. Oh, and I’m breaking in the new Speidel fermenter, a 7.9 gallon HDPE jug with an oversized airlock and a valve so I can let gravity drain my wort into the secondary fermenter. Keys to good extract brewing: Fresh extract. The Brew Hut goes through a lot of it so I’m reasonably sure theirs is fresh. Good grains and a good crush to get the “good” from the steeping grains. A full boil helps, gives you less kettle caramelization and better hop extraction than a concentrated boil. The rest is the same as with all brews: Sanitation, a good boil, long enough to drive off any DMS, a quick chill and pitching good, healthy yeast in the proper volume at the proper temperature. One more thing before I go, the Chihuly-esque glass art at Sweetwater Brewing. A local guy did it from bottles, so everything is brown. Still, it’s a nice piece for a brewery. It’s good to be home again…. Back in Aurora at the Dry Dock Brewery with Wife… Life’s good! Okay, this Georgia tasting room crap is simply wierd. You show up and there’s a two hour window for tasting. The brewery is limited to providing you no more than 32 ounces of beer and they can’t directly sell it to you. So Sweetwater has three options: You get a plastic cup and six tickets tradeable for a five-ounce pour each. Or you can buy a pint glass for $10, ditto the five-ounce pours. Or you can make a donation to keeping the Chattahoochee River clean and get a 14-ounce pilsner. Those five ounce pours are awfully damned generous. So here’s Sweetwater, hardly a “craft beer” brewery…. I mostly enjoyed Sweetwater’s beers, the seven pictured above (a sobriety test – the “420” Pale Ale is there twice) plus a firkin, a Centennial Peppercorn IPA. I got to sample all seven, thanks to a “local” with an extra ticket. The winner stylistically was the brown ale. The brewers took some liberties with styles, something I don’t mind if it works but in many cases it didn’t. The beers were subtly off, the malt too subdued, the hops too prevalent or incorrect to style. But on balance, Sweetwater produces a drinkable beer. And the bartenders, too, are put off by those strange Southern alcohol laws. This is not a small brewery and you have a two-hour window in which to drink their beers. But their beers are drinkable and the company is Southern. I even got a tip for dinner! Back in Denver tomorrow. I’m ready to be home. Sorry for the rant on travel. It’s off-topic. I just really, really hate spending my lifetime in airport security lines. I wonder how many “lives” the TSA takes through making people wait ever longer in security lines? Georgia beer, this blog being about things fermented and fermentable – no, TSA agents do not count, although some of what they confiscate might. Last night I found a local, relatively new watering hole called The Pig and the Pint here in College Park. One of their claims to fame is their rather extensive card of local beers – eight beers plus a hard cider are currently on the menu. Located just off Atlanta Airport on Virginia Ave, they’re not far at all from my hotel. So last night I went there to sample beers. The beers represent several of the local breweries. I have a copy of Atlanta Where that lists some of the breweries here in town. One of the interesting things here are the tasting room regulations. In Colorado, you buy a pint, a flight, a mass, whatever vessel the brewery serves their beer in. Here you buy a glass and tickets. 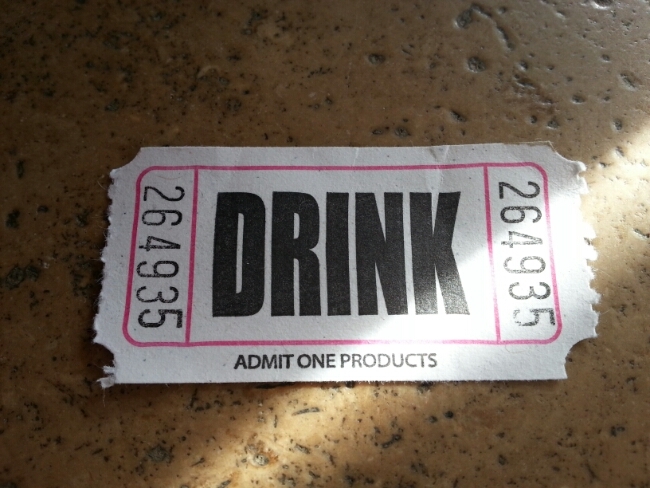 Each ticket is good for a third of a pour, in other words, three tickets gets you a full pint. So, by some twisted logic, the brewery is not selling you beer, it’s selling you a glass and tickets. But I digress. The breweries listed are Sweetwater Brewery, Red Brick Brewery, Monday Night Brewing, Wild Heaven Brewery, Blue Tarp Brewing and Red Hare Brewing. I hope to make it a point to visit at least one before leaving Atlanta on Friday. The Pig had brews from several of the above and a few more. I liked the Strawn Brewing Wheat, the Jailhouse Brewing Amber and the Monday Night Brewing Eye Patch IPA. Some of the others, well, a pils with American hops, a Hefeweizen IPA, a saison with too much lemon, a vegetal, roasty Brown, not quite on the mark. Tonight I went back for dinner. Eventide Brewing Stout is a very good beer and the Pig’s meatloaf is to die for. Georgia’s craft beer is a mixed bag. There are some really good beers I’ve tasted here, some a bit wide of the mark and some just plain missed. But that’s true everywhere. I’ve had substandard beer in Germany and Colorado and even made one or two. But as a wise photographer once told me, the key to success is try a lot of things and only show what works. I hope to get to a brewery Thursday night.